× 9 = fifty four Required Please enter the correct value. Tesla Motors Inc. (Nasdaq: TSLA) stock has gained 12% in the last two trading sessions and reached its highest price since April today (Tuesday) when the stock touched $235.54 this afternoon. Tesla has always been a momentum stock that experiences sharp ups and downs depending on the company's news, and this week's spike is a prime example. TSLA stock gained nearly 9% on Monday following reports that Nissan Motor Co. Ltd. (OTCMKTS ADR: NSANY) and BMW AG are in collaborative talks with Tesla to help expand electric vehicle (EV) charging technologies. The three automakers account for 80% of the world's EV sales combined, and, together, the companies are looking to solve one of the industry's biggest problems: vehicle charging. EVs have different charging standards depending on the brand, making it impossible for a Nissan owner to charge his or her car on a Tesla charger, and vice versa. Universal charging standards would benefit all electric car makers, as consumers could more easily power their vehicles. Concern over access to chargers, or "range anxiety," is thought to be one of the biggest factors holding back the EV market. "It is obviously clear that everyone would benefit if there was a far more simple way for everyone to charge their cars," one executive who declined to be named told The Financial Times. Yesterday's news followed last week's bold announcement from Tesla Chief Executive Officer Elon Musk that he would open up all of the company's patents to his electric-vehicle competitors. 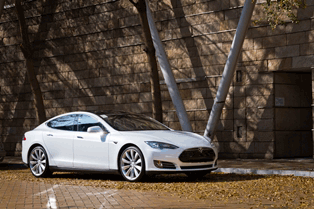 Musk noted that by sharing Tesla's patents, other car manufacturers could help expand and improve the EV market. "Our true competition is not the small trickle of non-Tesla electric cars being produced, but rather the enormous flood of gasoline cars pouring out of the world's factories every day," Musk said. "We believe that applying the open source philosophy to our patents will strengthen rather than diminish Tesla's position in this regard." The news of the three largest EV manufacturers joining forces carried into TSLA's performance today as the stock gained more than 4% by Tuesday afternoon.